On top of all the hosting company is very accommodating. My wife and I were set to check out at 10am on Sunday, however due to snowstorm on the previous night all the roads were closed. The host company not only offered us a free late check out at 1pm but also offered us an additional night for half price. The offer really warmed our heart! 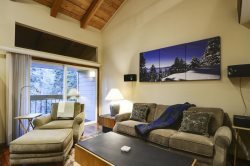 The cottage perfect for a trip to Tahoe, it is very cutely furnished (according to my wife), wonderfully stocked, and located just a few minutes walk to the safeway and the lake. It was a great vacation for our family. The apartments are well equipped for a good rest. We really liked it, we will definitely come back again. Incredible location!! Perfect little cabin for two. We loved it here and will definitely be back!! You could walk to anything in Tahoe City and the neighborhood was clean, safe and quiet! Location is closed to Safeway and snowboarding. Nice and clean condo. Super cute place!! Very cozy and nicely set up! Love the location! Great location, great amenities and was super clean! Loved how is was within walking distance of the beach and to restaurants, would highly recommend staying here, we will definitely be staying here again in the future! We had a great weekend in this cabin. The amenities are thoughtful, especially the kitchenware. Great place for old friends reunion! We had so much fun at this cabin! It is cozy and the kitchen is quite small with no dishwasher, so we'd suggest going out to eat rather than staying in to cook. Other than that, the house was very cute, cozy and well appointed in a fantastic location. Great outdoor space for the kids and dogs to run around in the summer. Great value! The place is conveniently located close to kings beach. The area is very quiet and the house was very clean. It fit our party of 7 comfortably and had plates and cups for us to use. They had grills, as well as a pool and sauna right across from the apartment. Highly recommend!